This entry was posted in Combinatorics, Cryptography, Group Theory, Number Theory and tagged algebra, cryptography, elliptic curves, mathematica, mathematics. Bookmark the permalink. Thanks for the great post – excited for the rest! Very informative! Thank you for the post. I’ve always been interested in learning more about elliptic curves and their use in cryptography. Could you recommend a book? Elliptic Curves: Number Theory and Cryptography, Lawrence C Washington is a really good book. I haven’t read the whole thing, but its very accessible and includes detailed proofs and chapters on cryptography. I believe your expression 3xx-2 should be 3x-2 when solving your second step. Nice explanation, thanks! One thing confuses me: why do you need the -16 factor in -16(4a^3+27b^2) != 0? Technical answer: you don’t as long as you’re working in a field of characteristic not equal to 2. Layman answer: This particular quantity is called the discriminant, and the general elliptic curve is usually stated simply to have nonzero discriminant. The discriminant gets tricky when you pick different number systems (e.g. one in which 2=0), because then the discriminant is always zero! 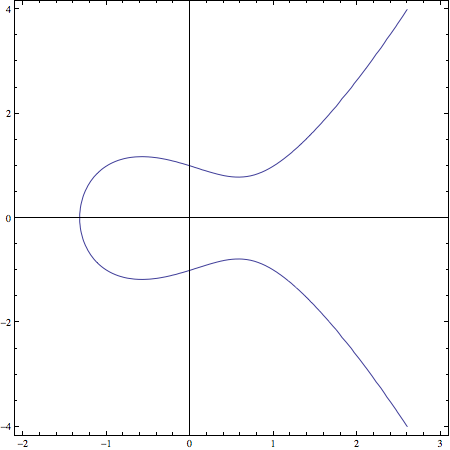 We’ll talk a little bit more about the “general” form of an elliptic curve next time, but suffice it to say that you can’t always get your elliptic curves to be in this special form. Please make your website friendly for those of us who use multiple windows – the width of your content is 800 pixels and obscured by your menu when the width of my browser is 960. If I maximize my browser window it’s equally silly, I can’t see more content at once… I just see white (black?) space everywhere. I don’t blame you, I blame Web 4.0 or whatever we’re on now – sometimes I pine for lynx. You should label your axes. How is the first animation not smooth? Can you provide more details on why they become a problem? At the moment it crosses the origin it gets a sharp cusp. See  for a still frame. 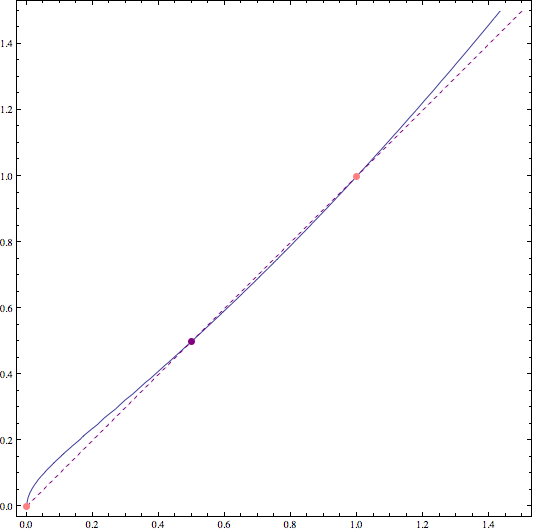 At this point the curve is not “smooth” in the sense that the cusp point doesn’t have a well-defined tangent line. 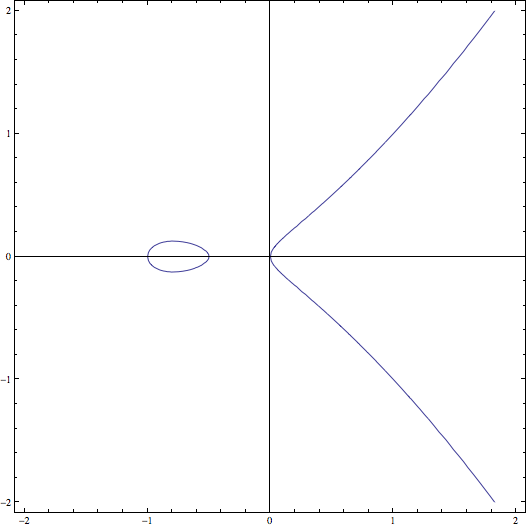 This causes the point-adding algorithm to fail, because as we’ll see next time we need every point to have a unique tangent to the curve (in short, to allow us to add a point to itself). The second has the same problem at the moment the bubble on the left first appears. I see. 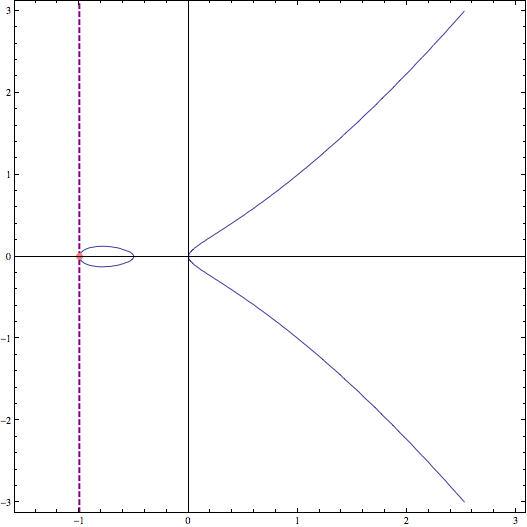 So, in the first GIF before the cusp shows up, it seems to also exist a point with infinite tangent (x = 0), is this not a problem because there is only one point? I am not clear why the solution to the original equation [y^2 = x(x+1)(2x+1)/6] had to be conditioned as y = x (?). Is this just a way of going about finding a 3rd solution, starting with (0,0) and (1,1), with no particular reason ?